Mr. Martin helped me so much when I had him @ Carver, he is truly an amazing person. I hope my kids will be as blessed as we were to have someone like him. Touching story, there was a teacher who had transformed a classroom in my seventh grade and shamefully have forgotten her name but not her smiling face or her excite in teaching. This is a great story! I hope my kiddo’s have teachers that leave such a great impression. Teachers are so important in our children’s lives, they deserve much more respect than they get. I agree with you! There are many incredible teachers who deserve respect! Thank you. It is really neat to have contact now and also to see how many other former students were impacted by him. This is such a touching story. Just goes to show the important impact teachers have on children’s lives. Thanks for sharing it. Also, thanks for following my blog. I hope you’ll continue to “like” reading my posts. I look forward to your comments. There are lots of good teachers in the world, but it is rare for a teacher to show such devotion and commitment. This is a wonderful tribute to someone who sounds like a really amazing teacher, person, and friend. I look forward to reading more of your posts. Thank you for reading and for your comment. Mr. Martin has touched the lives of many students through the years. Thank you reading my post and I’m glad you enjoyed it. 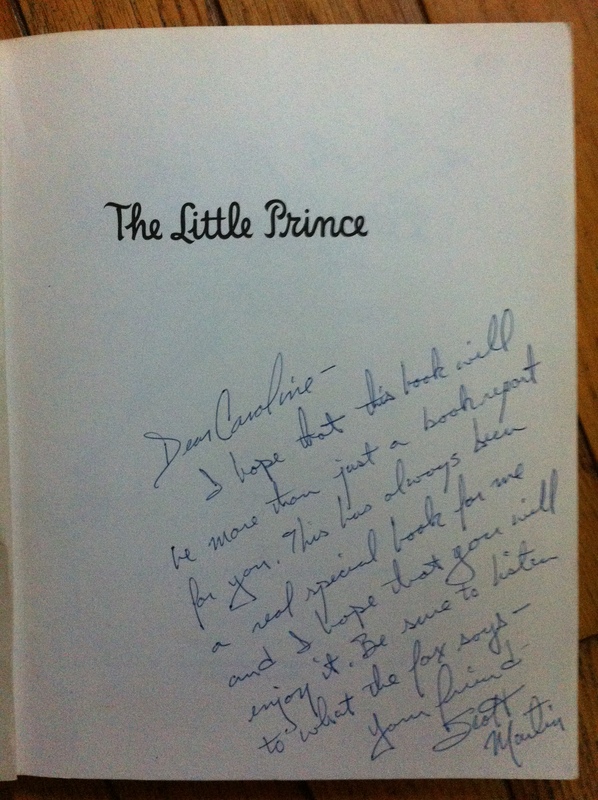 The Little Prince is a fantastic book and definitely transcends to all different situations in life! Obviously time fora re-read of “le petit prince” for me. I’m interested to see what itbringsme this time. Our adoption agency “terre des hommes” took its name from this book. There’s the sign. enjoy! It’s a good one! I love this post! What a blessing he was in your time of need! Thank you. Yes, he really was a blessing during that time.